Like a lot of manufacturers the DHMC usually broke up their prototype vehicles for other projects, but they also suffered constant cash flow difficulties. In early 1956 Peter Wilkes, Technical Director of Rover and friend of the Healey family came into the DHMC looking for a sports car. Some years beforehand Peter in partnership with Spen King designed that Marauder motor car using Rover components. King many years later designed the TR7 and the Range Rover. Selling the car to Peter was useful, not only for the cash but also for the feed back of the vehicle in constant use. The next owner is a bit of a mystery but during his period of ownership he was having an affair with the wife of a friend. The liaison was discovered and the husband being not too impressed set fire to the BN3/1. As you would expect the owner was not full of gratitude and in the resulting fracas the husband was stabbed and killed, a long gaol term ensured for the owner. The BN3/1 ended up in a wrecking yard. In 1959 Malcolm Lorraine was looking for spares for his panel beating business when he found the car. For the grand sum of £50 the remains were his to take home to Cornwall. Malcolm finished the car in 1960 and not long after received advice from a finance organisation that they intended taking possession of the car. It appeared that the gaoled owner had borrowed money for the purchase and now had no means of repaying his debt. Malcolm said they could take the car but had to pay him for his work on it. The financial company backed away. Malcolm used the vehicle spasmodically over the next 11 years, eventually selling it to a friend in London, who used it daily, where it soon suffered from a severe dose of ferrous oxide. BMC with the introduction of the new six, requested DHMC to test an engine in an Austin-Healey prior to production. The new ‘C’ series engine was suppose to be lighter and more powerful then the four, but was heavier negating any increase in BHP. This new project was given the experimental number X207 by the DHMC and following extensive modifications to a 100 BN1 chassis a ‘C’ series engine coupled to a four speed gearbox was fitted. It was a tight fit resulting in the radiator being positioned way forward of the standard position and the rear of the engine very close to the firewall. As you would know the title BN generally meant two seater. The BN1 and 2 had two seats, BN6 and BN7 also only had two seats, but somehow I suspect that the use of the BN title such as this didn’t really commence until the 100/6 BN6. After all the BN4 was a four seater. Avid readers of the Austin-Healey publications that abound these days would have realised that there was also a BN3 and BN5. There was one BN5, a 4 seater used as a mule by the Donald Healey Motor Company (DHMC) for the 1957 Mille Miglia. with disc wheels and detuned engine and was eventually converted to BN4 specifications and then sold. 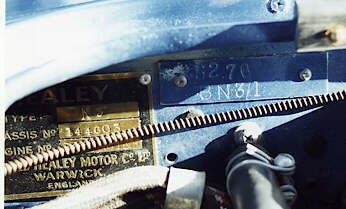 Geoff Healey in his book "The Healey Story" published not long after his death stated that "NWD 977 was fitted with one of the experimental headed engines that Morris Engines had built with three twin-choke SU carburettors. These carburettors had been used on many of the Coventry Climax large four-cylinder racing engines with great success. SU fitted the carburettors with a part throttle-weakening device which was essential to avoid an over-rich mixture at moderate road loads. When everything worked properly this set-up gave excellent results." The engine is a tight fit in the 100 body. The fire wall was deliberately hammered into a concave shape in order to free up some more room. The 100 had evolved through the BN1 and BN2 and the 100-Six emerged as the BN4. (Incorrectly as it happens - it should have been the BT4!). So what was the BN3? In fact the BN3 was the original 100-Six, because that is exactly what it was....a 100 with a six cylinder engine! The above car is BN3/1 and is owned by Patrick Quinn in Australia, who also restored it to its concours condition. Geoff Healey confirmed that this was the original colour of this car. 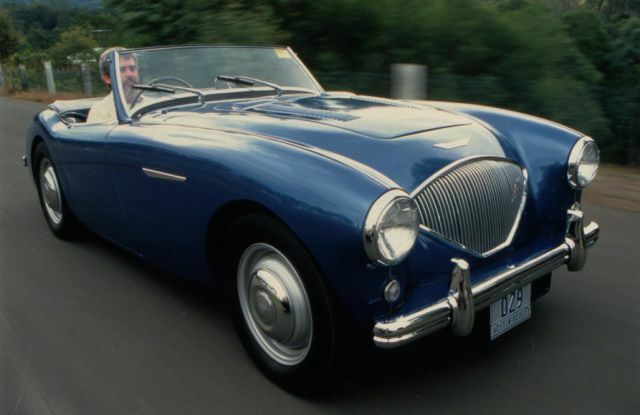 To enhance the appeal of the Austin-Healey, Donald Healey decided that with the new six cylinder the vehicle should be offered with four seats, therefore appealing to prospective owners with children and especially their spouses. The BN3/1 was dispatched to Jensen for the necessary modifications and Geoff summed it up by saying, "The prototype body was built at Jensen and we assembled the complete vehicle at Warwick and registered it NWD 977. Much of the test work with different heads and manifolding was carried out on this vehicle." A suitable shallow seat from a tractor was found that did not foul the differential housing. The BN3/1 or X207 was then given the name "CHUMMY" by the DHMC, representing the close positioning of the occupants not unlike that of an Austin 7 Chummy. The vehicle was nearly right but in production BMC lengthened the wheelbase by just under 2 inches providing more leg room for the rear passengers, changed the grill, enlarged the front shroud opening and bonnet, installed a scoop into the bonnet to clear the radiator cap and introduced door handles. The production car became known as the 100/6 BN4. Geoff Healey and the DHMC experimental team worked to extract more power out of the six cylinder using the BN3/1 now registered NWD 977, as the test vehicle. The new six cylinder head as we now call the eight port head incorporated a gallery running its length supplying the fuel/air mixture to the cylinders, breathing through one or two 1½ horizontal H4 SU carburettors, a design that was economical to produce but limited available power. The answer was an experimental cylinder head featuring separate induction ports for each cylinder and breathing through three double-choke SU carburettors. I have seen photos of double-choke SUs but have never seen one in the metal. It was March, 1974 when I was a callow youth enjoying my BN1 in the Australian sun. 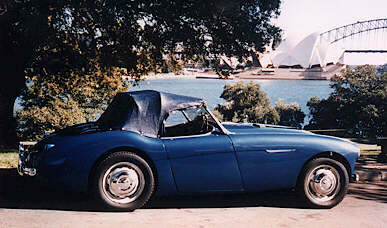 At 23 I had become expert at the intricacies of the mechanical components of my Healey. Through a friend living in the UK I learnt that the BN3/1was up for sale in London. Like most young people I spent what I earnt, but with the help of a fellow Healey owner in the finance industry the funds were soon available. (Incestuous lot Healey people are!) Not before long the vehicle was on its way to Australia on a roll on-roll off ship. That’s right no container, something unthinkable these days. In August 1974 my ship came in with the car on it. Working in a tall office building in Sydney I overlooked Darling Harbour, when it actually handled cargo. I saw the BN3/1 for the first time when it was carried from the ship by forklift and deposited in the open on the wharf. I was ready to sprint down to the wharf and drive it home but due to delays with Custom paperwork I had to wait another 5 days, during which it rained solidly. With my nose pressed up to the window I had the enjoyment of watching large wharfies repeatedly try the cockpit out for size. I finally got it home after paying wharf storage and steam cleaning, by which stage the inside of the car was a sodden mess. My first impressions? RUST, RUST and then more RUST. Badly faded red paint, rotten black carpet and cracked seat covers. However it was quick, very quick and I loved it. I had never seen so much rust in a big Healey before but then again this was during the days before classic cars were being imported in great numbers to Australia and I hadn’t seen many imported rusty cars. With all my fingers crossed I did manage to register and then use it for a few months before retiring the car to await its inevitable restoration fate. In the meantime it was wedding bells for me, a new home with a suitable garage of course, bless my wife. In 1978 the restoration started in earnest, boy there was a lot of rust. Not only did I have rust in the chassis, floors, subframes and guards but also severe corrosion in the aluminium panels. 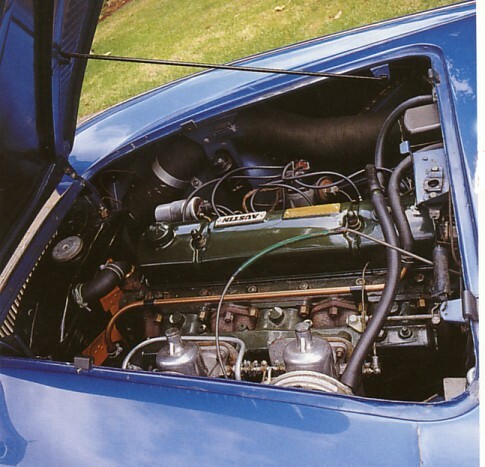 Unlike other Austin-Healeys it is virtually impossible to remove the engine through the smaller four cylinder bonnet opening so the body was removed first. The outside of the engine was amazing, looking as if painted by the dribble method. Pouring paint on the top and letting it dribble down the sides until it stopped and dried. Eventually the vehicle was stripped to the bare chassis. I can weld, panel beat and paint but wasn’t comfortable about attacking such a big job. Luckily Steve Pike in Melbourne, who is still a good friend, had just commenced working on Healeys full time, so the chassis was dispatched to the south. Photos of the sandblasted chassis were sent to me showing a lot of empty space where metal should have been. Like all classic car enthusiasts I intended doing lots of useful things during the time it was away and your right I did absolutely nothing. However I did write to Geoff Healey and ex DHMC employees seeking information about the car. It was an exciting day when the chassis arrived home in glorious red primer. I had intended painting the car red, as it was when I bought it and had purchased red trim. To my surprise Geoff Healey told me that it was originally medium metallic blue and sent me a colour chip. I managed to find some original blue paint on a portion of rusty boot floor that had been removed prior to sandblasting. Red trim was sold to the highest bidder. The chassis was painted in my driveway and I was soon feeling that the parts stowed away would go together to form a complete car. Then came the best part. I find it an pleasure to clean and paint parts and refit them or new parts to the chassis. With each part you can actually see a real car coming together before your eyes and pride of accomplishment swells inside of you. I recall vividly the first part to be fitted, the driver’s side front shock absorber rebound rubber. The engine was in reasonable condition and received new rings and bearings, new bearings for the gearbox plus a new clutch and pressure plate. Refitting of the mechanical components was straightforward with the exception of the engine. During the chassis restoration I had straightened out a concave and dented firewall but found that the engine just wouldn’t fit as it was hard up against the firewall. Yes it was factory dented, so out came the big hammer and before long the firewall was concave and dented again. 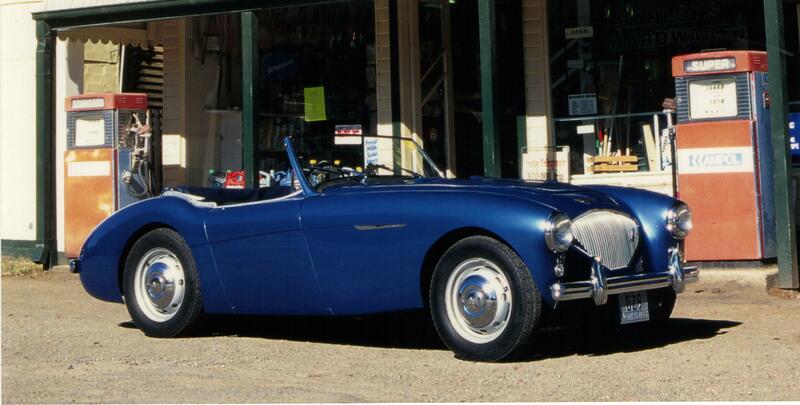 I was a very proud Austin-Healey owner when after eight years the engine fired up again in July 1984. I couldn’t resist driving the bodyless vehicle around the block a few times just to make sure it went the way I hoped - it did! I was not prepared to trust my own limited talents on the body so once again the BN3/1 made the trek south to Melbourne, and a few months later it was back looking absolutely resplended in its medium metallic blue. A day later disaster struck when reversing the car down ramps in the garage. The driver’s door caught on the garage frame, creasing the door and front guard. I was so upset that my wife thought that I had run over one of the kids. I won the Hard Luck Trophy in the Austin-Healey Owners Club that year, a mounted broken rear crankshaft journal. Next came the fun of fitting the chrome work, carefully to avoid scratching the paint. The windscreen wasn’t much fun as we managed to break two in the process. A friend of a friend who taught upholstery at Technical College here in New South Wales, did a wonderful job on the trimming and twelve years later it still looks great. Then came the dreaded Roads and Traffic Authority pits where it sailed through and we drove home on August 15th 1985 in our newly registered Austin-Healey. Again registered NWD 977, the same as in the UK. The feeling after not driving it for nine years? Exactly the same, with the only difference of two little people occupying the rear seats. As with most newly registered cars we used it constantly during the first few months and then only during sunny weekends. That was okay because open sports cars can be highly impractical especially when child number three came along and eventually number four. Initially we had a high success rate at our club’s concours, but it is amazing how a restored car soon becomes yesterdays winner following a few stone chips to the paint, the engine bay looses its gloss and oil appears on the chassis. I truly admire those classic cars owners who keep their vehicles concours prepared from year to year, something that I find very difficult.